On Oct. 27 to 28, 2005 O'Kim's hosts a Halloween party of devilish diversion and dissipation. One cover charge includes a door prize and Halloween cocktail. O'Kim's will also be channeling the supernatural of all worlds with fortune telling. Events include "Couple Mummy Wrapping," a costume contest, guessing the weight of a massive pumpkin, a lucky drawing and more. Win prizes such as bottles of whisky or wine, hotel accommodations, dining certificates, cigars and more. 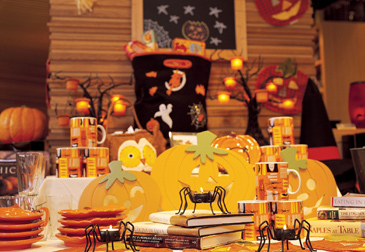 Halloween festivities continue for both days at O'Kim's downtown, in the Westin Chosun, Seoul. Cover charge is 20,000 won. At O'Kim's Brauhaus, the party hits huge for one night only, Oct. 28, 2005 at the COEX in Gangnam. Cover charge at Korea's first microbrewery is just 5,000 won and includes 400cc of house beer. During the haunting holiday, from Oct. 28 to 30, 2005, O'Kim's Brauhaus also features a Dracula set menu, with Ghost Dduk Galbi Steak and 400cc of house beer. Hours: 6:30 p.m. to 2 a.m.
For other details please contact Ms. Joo-Yeon Ahn (317-0226), PR coordinator, the Westin Chosun, Seoul, and Mr. Rae Hyun Kim (317-0455), the hotel's PR manager.